I didn’t expect to fall in love with Mexico City. But I did. And I fell hard. I can’t really explain why…except that everywhere you look, there is something intriguing, colorful, exotically beautiful. I was thinking about this as I strolled the Avenida 5 de Mayo pedestrian walkway. I had just left the famous Casa de los Azulejos (the “House of Tiles” where the landmark façade is covered on three sides by blue and white Pubela tiles), where I had devoured a breakfast of huevos divorciados: two so-called “divorced eggs,” separated by a line of refried beans, one side smothered in salsa verde (green sauce) and the other in salsa roja (red sauce). Mexico is always full of surprises. Art and innuendo are everywhere, especially in the way food is prepared and presented. Another of my favorite foods, chile en nogada, is typically served during Mexico’s Independence Day celebrations in September, and incorporates the colors of the Mexican flag…a green stuffed poblano chili, covered with a creamy white walnut sauce and sprinkled with sparkling red pomegranate seeds—you must try it if you get the chance. My walk took me past small museums (Mexico City has upwards of 150) and a church courtyard where dozens of young people in neon-plumed serpent costumes danced, bells strapped to their ankles. Why were they there on a regular old Tuesday workday morning? Who knows. … That’s the magic of Mexico—, where the unexpected should always be expected. I veered off track to the famous Dulceria de Celaya sweet shop, where I was tempted to buy one of each of the literally hundreds of pastel-colored confections. I settled on two dulces de limon…candied limes stuffed with a sweet coconut filling. I planned to save them for later but lack of willpower saw them devoured before I reached the Zocalo. 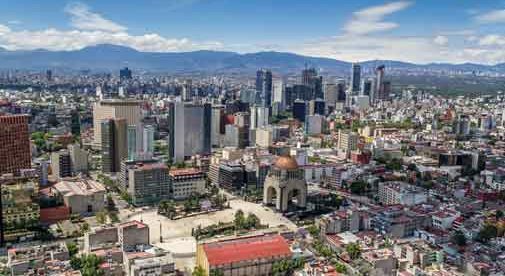 You cannot come to Mexico City without a visit to the Zocalo, one of the largest city squares in the world. It’s a place for gatherings of all kinds…parades, concerts, political rallies. … In the summers, sand is brought in to create urban beaches where children can build sandcastles and their parents can play volleyball. In the winter, a huge skating rink is erected beneath a towering Christmas tree. That day, as I stood in the middle of the Zocalo and took it all in, well-fed and happy…warm sun on my head, children laughing and playing…I couldn’t think of anyplace I’d rather be than right here, right now.